Woodland Park Zoo Blog: Welcome Dhirin, our new male snow leopard! Have you noticed a particularly handsome new face at the snow leopard exhibit? That would be Dhirin, the most recent addition to our snow leopard family! 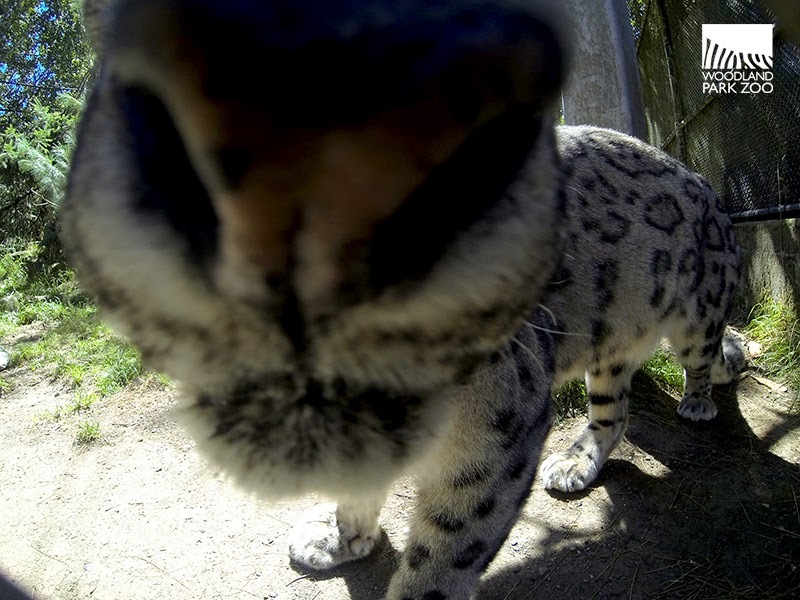 VIDEO: Dhirin the snow leopard explores his new exhibit. We set up a GoPro camera at the back of Dhirin’s exhibit to see if we could catch a glimpse of him as he explored his space, then stitched together a few of our favorite moments for this video. In the wild, snow leopards are hard to track or study, but motion-sensor cameras and radio collars provide researchers with a better look into their behavior. Thanks to research and care in zoo settings, we can apply these two tracks of knowledge to better understand these disappearing predators. The 9-year-old male was born on May 24, 2005 and lived at Oklahoma City Zoo. Dhirin arrived in Seattle in early July 2014 as recommended by the Species Survival Plan, a conservation breeding program across accredited zoos. 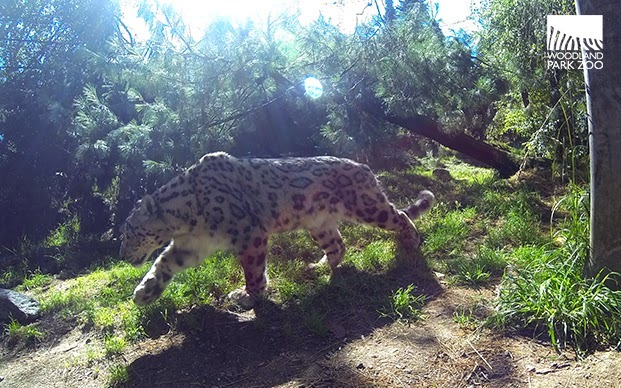 Woodland Park Zoo’s patriarch, Tom, was swapped with Dhirin in order to keep the genetic diversity of the snow leopard population varied and fluid. Tom and Helen, our resident female, had two litters of cubs together at Woodland Park Zoo, and despite a few challenges, their genes have been well represented. Now, it is Dhirin and Helen that will be paired up and, fingers crossed, will begin their own family soon. 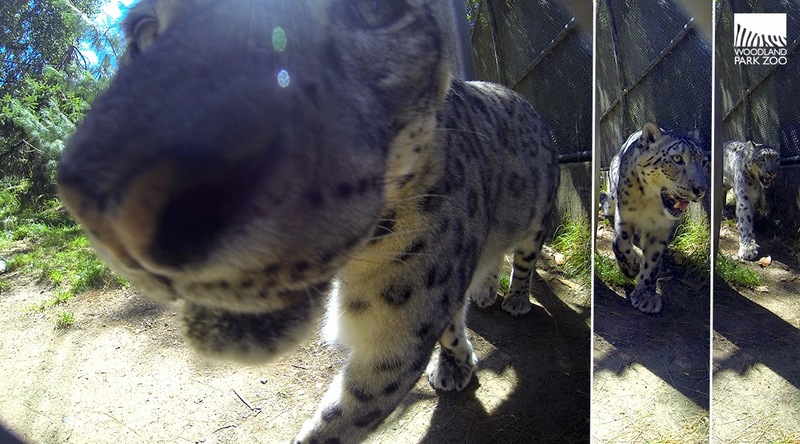 A snow leopard greeting! Dhirin gets nose to nose with our camera. Photo by Kirsten Pisto/Woodland Park Zoo. Keeper Amy describes Dhirin’s disposition as “very sweet and go with the flow.” He is a calm cat and although he is still getting to know his keepers here, he is very cooperative during shifting on and off exhibit. Dhirin has solicited attention from keeper James by letting him scratch his head and talking while James is nearby, signs that Dhirin is comfortable around James. Keepers say that Dhirin is especially vocal, and his noises are more like a meow than the typical snow leopard chuff. This noise is sometimes described as a prusten and sort of sounds like a grunt. Dhirin has been exposed to a more diverse palette in Seattle than his diet in Oklahoma, so he’s been able to sample chicken, rabbit and guinea pig! So far he has preferred the chicken and isn’t totally sure what he thinks about the guinea pig. Photo by Dennis Dow/Woodland Park Zoo. And what does he think of his new mate? Dhirin is infatuated with Helen, but keepers tell us that Helen isn't sure about him quite yet. The cats can see and talk to each other in the behind-the-scenes area of their exhibit, but the two won’t actually have access to each other until Helen is ready. Right now, Dhirin likes to keep track of Helen and tends to respond positively to her scent. Helen is adjusting to his presence and although she usually just stares at him with her ears back (not a positive sign from a cat), keepers say she is getting used to him. Snow leopards typically breed in February, but Helen’s cycle is a bit unpredictable, so keepers will closely monitor her behavior to see when she is ready to bond with Dhirin. When the time is right, Helen will want nothing more than Dhirin and her days of snarling at him will be a thing of the past. Check out Dhirin’s very fine spots at the snow leopard exhibit in Australasia. Those large paws are specially built for pouncing across the snow. Photo by Kirsten Pisto/Woodland Park Zoo. Conservation ambassadors for their species, Dhirin and Helen represent a precious and endangered member of the cat family. Snow leopards in the wild are threatened due to demands from the black market as well as significant habitat loss. Dhirin struts his stuff for the camera. Photo by Kirsten Pisto/Woodland Park Zoo. With Asian Wildlife Conservation Day on Saturday, August 9, you can visit the zoo to learn more about these elusive and mystical creatures and ways to help protect them. The future of snow leopards is dependent on our commitment to preserve their habitat. While people have been the greatest disruption to the snow leopard population of Central Asia, we can change that. 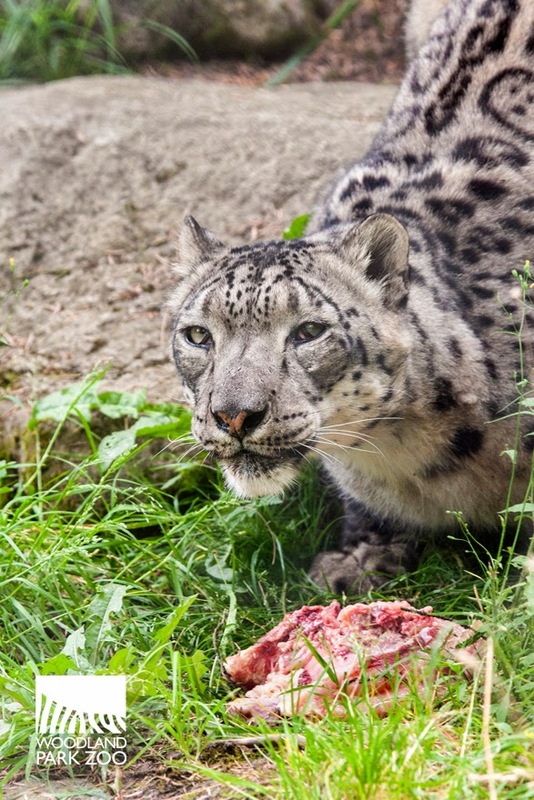 Pledge never to buy or sell illegal animal products on the black market and support conservation organizations like Woodland Park Zoo's partner, the Snow Leopard Trust, which help preserve their natural range. See you at Asian Wildlife Conservation Day! 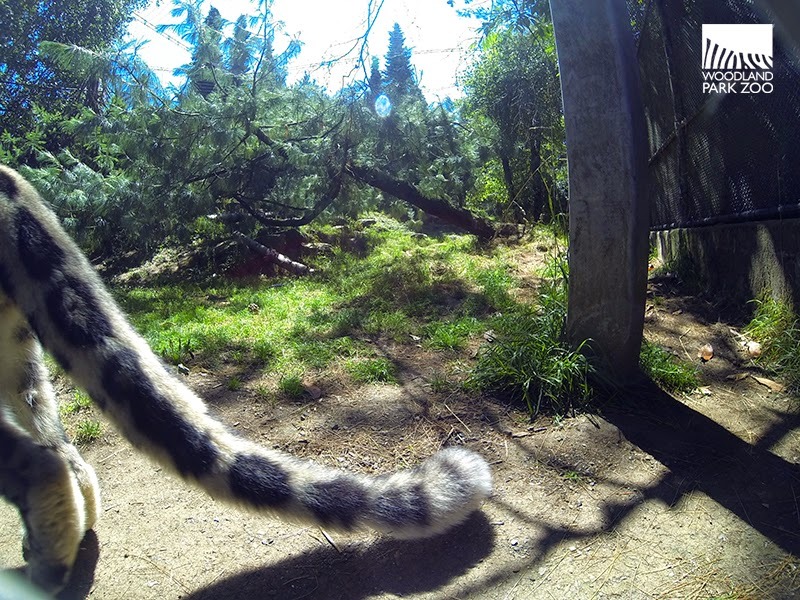 The incredibly furry 3 foot long tail assists in muffling a snow leopard’s face and lungs from the freezing air. Photo by Kirsten Pisto/Woodland Park Zoo.